A horrific car accident put Jovienne in a coma. When she awakened months later, she was told that her family had died. And Jovienne? She felt different...irreversibly changed. Years passed, and she was raised by a stranger who trained her to use the quintanumin. She excelled at every lesson, and she longed for her mentor to become much more. When the time came for her final test, a death-match against a demon, she uncovered a terrible truth: the man she had trusted to teach her had a dreadful secret, and Jovienne had become a monster's monster. Jovienne was something of a mixed bag read for me. I adored the plot idea, which was original, fresh and full of great potential. However, I never really connected with Jovienne. I wanted to care about her, relate to her, but I simply couldn't, and that lack of empathy with her affected my overall enjoyment of the story. I did like the secondary characters, such as Araxiel and Andrei. Even so, right from the start Robertson throws the reader into a complex plot, starting at one point and then jumping back in time, without sufficient world building for us truly to understand what's going on. Things do become clearer as the story progresses, and I came to appreciate the mythology, but Jovienne's decisions still seemed completely erratic. In conclusion, I am awarding this book three stars. 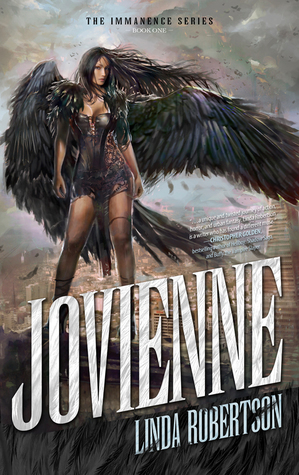 I adored the premise; however Jovienne's characterisation and insufficient world building early on let down what could easily have been a four star story. This is the first work in a series. Based on this first book, I would consider reading the second, but I wouldn't rush out to grab a copy.